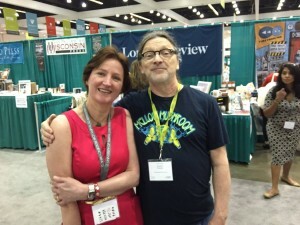 So I went to AWP in L.A. last week — the mega conference and book fair. And it was interesting, because I noticed something about myself — and what I noticed pleased me, because it meant, friends, that I had changed, that I was not the girl I used to be. And though some might think this a shame, I found it a relief and quite pleasant. I spent much of my youth, see, entertaining and being entertained by older men. And some of these men were great, and still are. But some of them — not so much. In fact, some of them, in a few vital cases, let’s admit, let me down. Or is that they way to put it? Maybe not. Maybe it was more that they didn’t choose to do something for me, as a friend, when they could have, when I asked them, when it would have made a difference. And at the time — or times — I accepted this, and continued on with them, but I was not so much hurt as sort of baffled and taken aback. Because why would a friend not help another friend, particularly a younger friend who could benefit so? Honestly, I didn’t know. And there they were, at AWP, these few older male friends who I hadn’t seen in person in years, and who in the past I used to go back to even if they hurt me because back then I had this compulsion see — stay with me — to please these older men, to win them over. But I also learned, over time, that there is such a thing as generosity, and that some people are just more generous of spirit than others. And those are the people who give to you not because they owe you, or you owe them — but because they can give. So I spotted one of the older men in the lobby of the Hotel Marriott, and another signing books at his VIP table. And whereas once, I would have approached to say hello, and smile and chat a while, this time I didn’t. This time, I stayed in my seat, I walked on by. You only get so many chances to be generous in life, and he who goes back to the empty hand is a fool. I am not a fool now..
And by moving on this time, by the way, I came across a whole bunch of other people, such as Toni Neale (essays out this week in The Miles Between Me) and Sean Bernard — handsome young writer of Studies in the Hereafter — and the famed wild and eccentric Mr Richard Peabody –– all of whom gave to me freely, and openly, and without fear — and who knows if I would have met them if I’d been hanging around trying to please those who couldn’t quite be bothered…. Cheers to the wise mind, and to smartening up and to being there “when the right one comes along.” Below: Me and Mr P who also published me in Gargoyle 64 this year — thank you. This entry was posted in Uncategorized and tagged Gargoyle, Richard Peabody, Sean Bernard. Bookmark the permalink.